Wholewheat spaghetti is a new discovery at ours, and it’s a nutty and delicious one — I just wish we’d given it a try sooner. Add to that some smoked streaky bacon (crisp, of course), Parmesan shavings, irony greens and juicy lemon, and you’ve got yourself a simple and light meal. 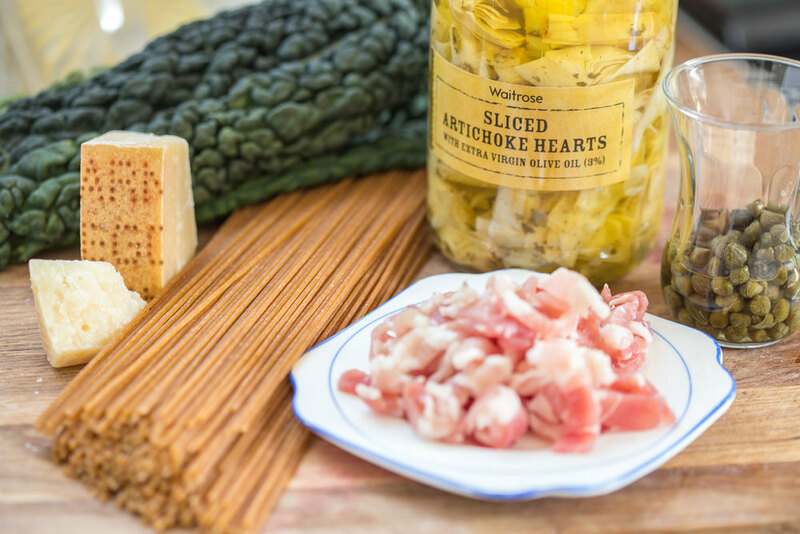 But, to take it to another level, try adding a few smooth and rich artichoke hearts and some punchy, tart capers. They add a special touch to all kinds of meals. Both are great on pizzas (homemade or otherwise) and in chicken stews, and capers are an excellent addition to fish pies. Not only that, they keep well in the fridge for ages and you can pick them up from most supermarkets. So next time you’re shopping, skip the tinned tomato section and find jars of these near the olives and pickles instead. Put your spaghetti on to boil in salted water, it takes around 10 minutes. When you’ve got around 6 minutes left, get a frying pan on a medium high heat and add a couple of tablespoons of cooking olive oil and start frying the bacon, when it starts to colour, add the capers and artichokes. Then with just a minute left on the pasta, add the leafy greens you chose to the frying pan, and add a ladle of the pasta water to the frying pan - the water will be cloudy and help to thicken the liquor a little. Add the lemon, a couple of slugs of extra virgin olive oil and black pepper to the frying pan and take off the heat. Drain the pasta and put it back in to the pan, then pour over the contents of the frying pan, and gently stir through. Serve in bowls and give a generous shaving of Parmesan.